Visual testing is used to examine what happened at the point of software failure by defining the data in such a way that the developer can quickly identify the reason of failure, and the information is expressed clearly so that any other developer can utilize this information. Visual testing aims to show actual problem rather than just to describe it, remarkably it increases understanding and clarity so that the problem can be solved quickly. The general meaning of visual is optical means what we can see. Therefore, visual testing requires the video recording of the entire process. It captures everything that happens at the time of system testing in video format. Tester gives a picture in a picture webcam and audio commentary from microphones as an input value. 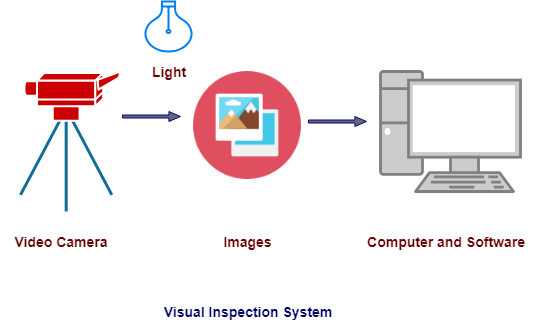 System for visual inspection consists of a high-quality video camera for collecting data and software and computer to analyze data. The video camera is used to capture a picture of the object during the testing process. These object pictures are sent to a computer via a frame grabber. The computer has software that analyze the pictures and decide whether the object fails or passes the inspection. The conditions under which the video testing system works necessarily well controlled and easy to maintain testing persistence. Visual testing offers a number of advantages. It increases the quality of communication drastically because testers can optically present the problem to the developer as opposed to describing it in written document form. The developer has all the required evidence of a test failure so, the focus is only on the cause of the failure and how to fix it. Visual testing is cheap because information is recorded in video form. So, we don't need to replicate the information in any other form. It saves money. Visual testing provides portability. A tester can provide video to any other tester if the type of software is same. So, in the case of system failure, we don't loss the data. Visual testing saves the time of testing as if once the testing process is done and saved in visual form so, we do not need to test software again. Developer can identify the defect by seeing the video. Visual testing requires the minimum number of special skills. Visual testing requires minimum part preparation because there is a need to find only the reason for system failure. Visual testing is suitable only for the surface which can be visible so, need to arrange suitable surface. Visual testing cannot detect hidden defects; it can detect only larger defects. To record clear visible video lighting must be well implemented. It follows only rules does not emulate human inspections. Scratches and cracks can create misinterpretation. Visual testing does not provide component variations on the product if there is variation in software components it cannot be tested via visual testing. Visual testing is used when we test software with easily detectable defects and do not allow component variations.